I am a baking machine these days; the kids love it and we are gonna be the envy of the PTA bake sale. I was thrilled to spend this past Saturday creating festive Cranberry White Chocolate Haystacks and White Chocolate Cranberry Chews. One recipe was a “no bake” which we will no doubt recreate in my kid’s classroom this coming week and the other was super yummy easy to bake recipe. 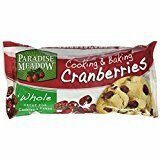 Both contained Paradise Meadow’s Cooking & Baking Cranberries; 2 kinds (Julienne and Whole) depending on your recipe need. These are fat-free, gluten-free and all-natural which speak my “mommy language”. The sky is the limit; cookies, muffins, loaves! Now I want to be honest: my office is full of holiday treats, cookies, chocolates and all things BAD. One way for me to avoid the unnecessary sugar rush is to enjoy their Whole Jumbo Dried Cranberries. Zero artificial flavors, zero cholesterol, zero gluten, zero GMO: bake with them, snack on them, toss them in a salad. These are the best! Head over to http://paradisemeadow.com/ for more info and awesome yummy recipes!